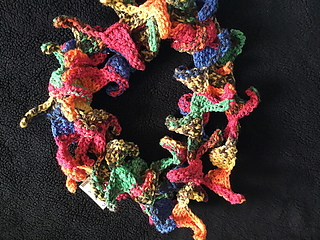 This is a lightweight scarf or cowl in a variegated or striped yarn. It can also be made in a new color for each neck length. If you use a full 50 gram ball for one scarf, it will wrap around the neck 3 or 4 times. Use the hook size recommended for regular crochet as this will help the fabric to curl. You won’t need a Tunisian hook for this if you can fit 11 stitches onto a regular hook. In this project you make short row curls or waves, bind them off and then TURN the work and add a new curl. This is a great project for on-the-go.